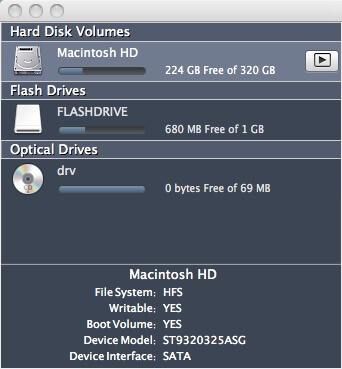 Disk Space Analyzer displays an icon for every volume, size, and free size. For selected volume shows detail information: file system type information, if a volume is writable, if a volume is bootable, device model and device connection interface. Use ⌘+I shortcut to show system volume information panel.